Valentine's cross patch printable. 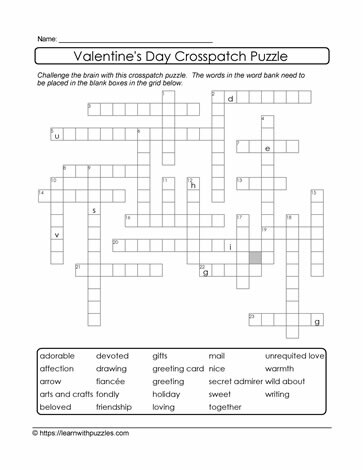 Here is a crosspatch puzzle for Valentine's Day. Students in elementary 3,4,5 grades classrooms will enjoy these brain teasers. To complete the puzzle, students need to fill in the blanks with words from the word bank. Some hints provided. Use in all environments: digital, Google, regular classrooms and the home schooling classrooms. Puzzles activate problem solving skills/strategies, and engage the brain in vocabulary building exercises.